↑ "Funeral held for Japan's prince". BBC Online. 29 November 2002. สืบค้นเมื่อ 28 April 2011. ↑ "Personal History of Her Imperial Highness Princess Takamado and her family". Imperial Household Agency. สืบค้นเมื่อ 2012-05-19. ↑ "Imperial Family Attends Spring Garden Party". Royal Hats blog. ↑ 4.0 4.1 4.2 "Princess Noriko marries son of Izumo Taisha priest, relinquishes royal status". สืบค้นเมื่อ 5 October 2014. ↑ "เจ้าหญิง "โนริโกะ" แห่งราชวงศ์ญี่ปุ่น จะทรงอภิเษกสมรสกับลูกชายเจ้าอาวาสใหญ่". มติชนออนไลน์. 28 พฤษภาคม พ.ศ. 2557. สืบค้นเมื่อ 6 ตุลาคม 2557. ↑ "Wedding Bells to Ring for Japanese Princess". Wall Street Journal Japan. ↑ "เจ้าหญิงโนริโกะแห่งญี่ปุ่น ทรงประกาศหมั้นอย่างเป็นทางการ". สนุกดอตคอม. 29 พฤษภาคม พ.ศ. 2557. สืบค้นเมื่อ 6 ตุลาคม 2557. ↑ "Marriage of Her Imperial Highness Princess Noriko of Takamado - Wedding Ceremony at the Izumo Oyasahiro Shrine in Shimane Prefecture". The Imperial Household Agency. สืบค้นเมื่อ 16 May 2015. ↑ "Private Wedding Reception". สืบค้นเมื่อ 1 December 2014. ↑ "Wedding Banquet". สืบค้นเมื่อ 1 December 2014. ↑ "Princess Noriko marries son of Izumo Taisha priest, relinquishes royal status". สืบค้นเมื่อ 5 October 2014. 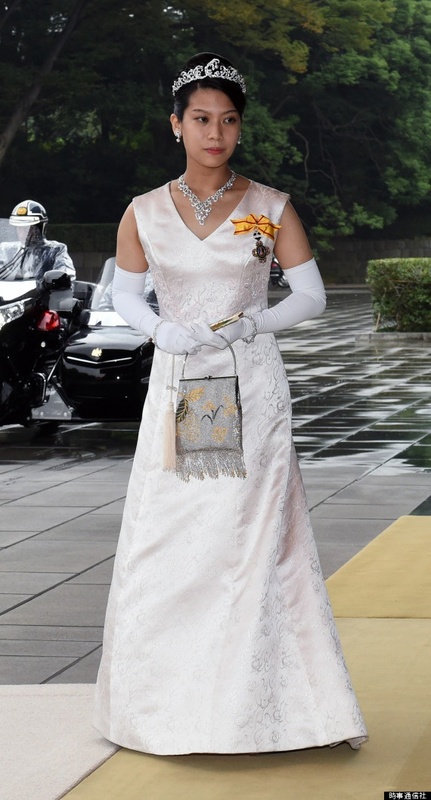 ↑ "Photo of Noriko wearing the peony of the Order of the Precious Crown". Imperial Family of Japan - Word Press. หน้านี้แก้ไขล่าสุดเมื่อวันที่ 14 เมษายน 2561 เวลา 07:20 น.